As Speak Onion, Dan Abatemarco treads on, then completely explodes, the line between producer and noisician. He spews seething noise, giant deformed beats and absolutely wrong atmospheres in fits and starts until nothing sounds like what it sounds like anymore. Breakbeats and basslines enter innocently but end up processed beyond recognition and drowning in feedback. Synth sounds are stretched, manipulated, and left ruined as chilling shrieks. The resulting sonic abomination slips between the dimensions of experimentalism, harsh noise, and beat-bashed breakcore. Dancefloor? Maybe. Slaughterhouse floor? Yes, definitely. Deep sub-basements, dank warehouses and sketchy bars are a natural fit for Speak Onion’s mutant sound. Insisting on energetic, spontaneous, out-of-control performance, Speak Onion eschews a laptop for a cobbled together pile of hardware, intermingling synthesizers, wrecked guitar pedals, homemade sound destroyers and even an iphone. He wants to up-end your party and leave your crowd with blown-out heads. This cannot be overstated: Speak Onion loves playing shows and has the YouTube videos to prove it. 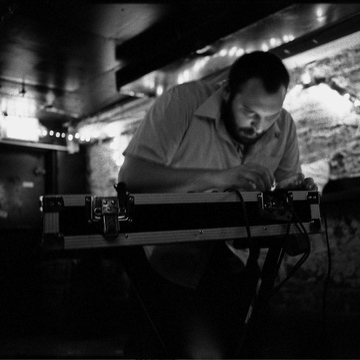 Speak Onion is NYC’s boss of drum’n’noise and is taking care of business every single day.